Only a snob could resist such a generous level of lunacy. ... not merely the rare sequel that is funnier than the original, it is one of the funniest comedies of its time, a veritable live-action cartoon from Joe Dante at his most unrestrained. An odd, but rewarding sequel that ups the ante on comedy and effects, and manages to offer a refreshing spoof of the first film. ... is one of the funniest comedies of its time, a veritable live-action cartoon from Joe Dante at his most unrestrained. 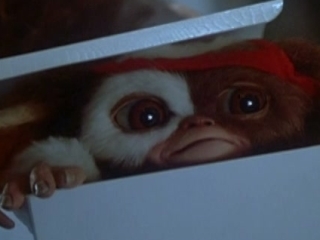 No, this was not your daddy's Gremlins movie. This was an entirely different kind of beast that was just made up of the same DNA. This uninhibited and uproarious monster bash, directed by Joe Dante, is more quick-witted and ironic than the original; it sets forth a savvy, slaphappy agenda before the opening credits and follows it straight through to the end, and even beyond. An amazing achievement despite a total lack of sincerity, and any film that can successfully work Slayer's grinding tune Angel of Death into the action is a masterpiece as far as I'm concerned. A riot from start to finish. An hilarious sequel featuring equal parts creature slapstick for the small fry and satirical barbs for adults. Actually better than the original in many ways: it's darker and more cynical, contains more pop culture references and takes on a bigger target. A loving celebration, and biting critique, of our pop culture-saturated times. Wilder than the first....a laugh riot! Speaks to the gleeful hell-raising monster in each of us, and it speaks with much more verve, cleverness and good humor than the film on which it is based. Add this to the very short list of sequels that neatly surpass their predecessors. Simply: This is Christopher Lee's 200th film. He plays a character called Dr. Catheter. I love movies.